Manhattan financier likes to keep friendships separate, no "homey hopping"
(LifeWire) -- For years after their 1988 divorce, Denise Patrick, 48, and her ex-husband had a great relationship. They sat together at their kids' sporting events, hung out on weekends and attended each other's parties. When your old friend poaches your new friend, it can leave you feeling left out. "We didn't just remain civil," says Patrick, a Houston branding specialist. "We were friends." But that changed several years ago when Patrick invited her ex to a party. There, her best friend at the time -- a single woman Patrick had bonded with after her divorce -- struck up a conversation with Patrick's former spouse. "The next day they went out on a date, and three weeks later they moved in together," says Patrick. "It was all very awkward." Patrick tried to continue both friendships, but after the two married in 2002, it became too painful. It felt, Patrick says, like part of her family had been taken from her. "I was devastated," she says. It's a phenomenon experts call "social poaching" -- when a friend or acquaintance mines your social network, without permission, for friends or romantic partners. It's a surefire plot device for many a novel, movie and TV series -- fans of MTV's "The Hills", for example, were treated to a season full of friend swapping and shifting alliances. Online social networks like Facebook and MySpace have even automated the process. And it's more common -- and detrimental -- than you may think, says Jan Yager, Ph.D., author of "When Friendship Hurts: How to Deal with Friends Who Betray, Abandon or Wound You." Poaching can lead to hurt feelings and broken friendships, says the sociologist. Some people, she adds, even go so far as to "intentionally avoid introducing their friends to each other because they like to keep their relationships separate." David Neverson, 27, has watched with mixed emotions as his social groups overlapped. After he introduced them, some of his high school friends started hanging out with his co-workers, who also now spend time with his college friends. "They confide in each other and talk about me," says the Manhattan financier. "It makes for a very complex friendship dynamic" -- one he calls "homey hopping." "Everyone seems to want to expand their social networks through me," he says. When one of Neverson's college friends began a relationship with one of his childhood pals, it made him uncomfortable. "It's bizarre," he says. "This is a friend that I used to go to summer camp with who's now hanging out with my college buddy." Ideally, Neverson says he'd keep his friends separate: "I'm really not a proponent of mixing friends." Andrea Lavinthal, author of the forthcoming book "Friend or Frenemy? A Guide to the Friends You Need and the Ones You Don't," says sometimes friend poaching happens in sneaky ways. "I had a work colleague who I really liked, so I invited her to brunch with me and my friend," she says. "A few weeks later I ran into them having dinner together at a restaurant. They had been hanging out nonstop without telling [me]." While she's happy for them, Lavinthal says the situation was odd, and she no longer keeps in touch with her former work friend. Beverly Hills psychotherapist Rebecca Roy-Jarboe says poachers often act without thinking. "When we feel rejected, it's natural to feel sad and angry, but looking at the situation from another perspective helps," she says. "Perhaps the co-worker or bridesmaid or friend is simply looking for a piece of herself in someone else, and that person is not you. It doesn't mean you aren't valuable -- just that friends are made for many reasons, change over time, and can come back together again when emotional and psychological transitions have been worked through." Novelist Lucinda Rosenfeld, 38, of Brooklyn, New York, admits to poaching. "I've definitely poached, but I've also made an effort to keep up the friendship with the original friend who introduced us," says Rosenfeld, whose upcoming novel, "I'm So Happy for You," addresses the intricacies of female friendships. "I've even gone so far as to gossip about the new friend with the original friend to prove my loyalty." Yager says social poaching is generally innocent: "It's usually not done in a malicious or vicious way." And it need not signal the end of a relationship, she adds; try to think of it as the beginning of a new three-way friendship. • Be honest. If you've been introduced to someone by a friend and you feel a strong connection, tell your friend, says Lavinthal. "Better to be up front than to go behind her back," she says. Plus, by giving her a heads-up, "you're complimenting her taste in friends." • Be inclusive. "It's good manners to ask your friend to join you the first and second time you hang out with the new person," says Lavinthal. • Branch out cautiously. Just as parents need to spend time individually with each of their children, says Yager, friends need one-on-one time, too. "Point out to your friend that spending time with just your new friend does not diminish your feelings for your old friend. Make an effort to spend time with each of them individually so your old friend won't feel left out or pushed aside." • Prepare for hurt feelings. Rejection and anger are natural reactions to friend poaching, says Roy-Jarboe. 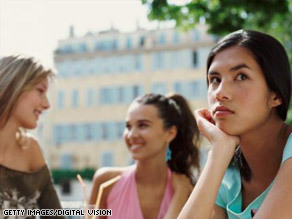 "As you start to spend time with your new friend, realize that there will be hurt feelings. Talk to your original friend about what she may be feeling. Give her a chance to express her feelings. Don't get defensive -- this is a natural response." • Be a friend. "Let the first friend know that you still value your friendship with her," says Roy-Jarboe, "but your friendship is different -- not better -- than the new one." LifeWire provides original and syndicated lifestyle content to Web publishers. Sarah Jio is a freelance writer who has contributed to "SELF," "Glamour," "Marie Claire" and many other publications.